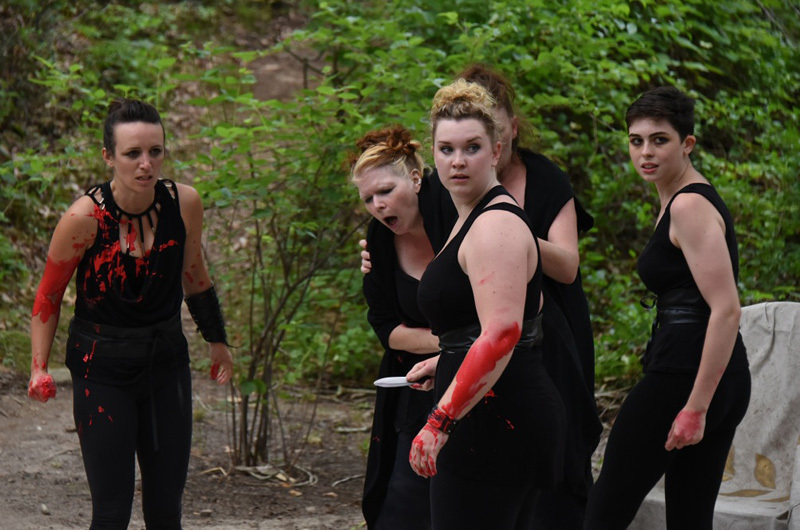 All female cast rocks the Tisbury Amphitheater during Julius Caesar performance. On a recent evening at the Tisbury Amphitheatre no curtain was raised and no lights came up. Instead, leaves rustled and dappled light shined through the trees as the cast of Julius Caesar marched down from the woods. The classic Shakespearean play tells the story of the fall of the Roman General in first century BC and the chaos that ensued. The show features rebellion, betrayal, assassination, blood, a haunting, the fall of democracy and the power of brotherhood. And in this case, every role is played by a woman. William Shakespeare’s work is said to have been so influential to society that in some respects he invented being human. Some 37 plays and 154 sonnets are attributed to him. So why did director Brooke Harman Ditchfield choose this one? “I was angry,” she said. Ms. Hardman Ditchfield doesn’t always make decisions based on anger. Some, like her decision to move to Chicago after college, are based on love. She met her husband Brian Ditchfield at Boston University when they were both undergraduates. When Mr. Ditchfield, now managing director of the Martha’s Vineyard Film Festival, moved to Chicago to pursue his interest in theatre, she moved there as well. When the couple decided to move to the Vineyard, that decision was based on love too — the love of a community that allowed them to have careers in theatre and film. On Monday, Ms. Hardman Ditchfield bustled into an Edgartown coffee shop, shaking rain out of her curly hair. The show was in full swing, with eight performances complete of a 20-show run. That morning, her daughter Isla had tried to get her to stay home. The four-year-old had strep throat and two ear infections from swimming in the ocean. “It’s like summer just wound up and bam, got her in the face,” Ms. Hardman Ditchfield said. Her daughter is also one of the play’s youngest fans. She sees Julius Caesar as a cautionary tale. She was also inspired by the Donmar Theatre in London’s all-female cast set inside a women’s penitentiary. But her characters are not female versions of the storied men. Ms. Hardman Ditchfield said she wanted to allow female actors to express strong feelings, but didn’t want it to become a parody of impersonation. The play itself deals with these questions in a stripped-down way. In the cast of eight, stage veterans and novices come together. Costumes are simple and the set is the natural environment. At a recent show, Shelagh Hackett delivered a confident performance as Caesar. The assassination of Caesar drew gasps from the audience. Her presence, like the doomed politician’s, was taken from the crowd too soon. 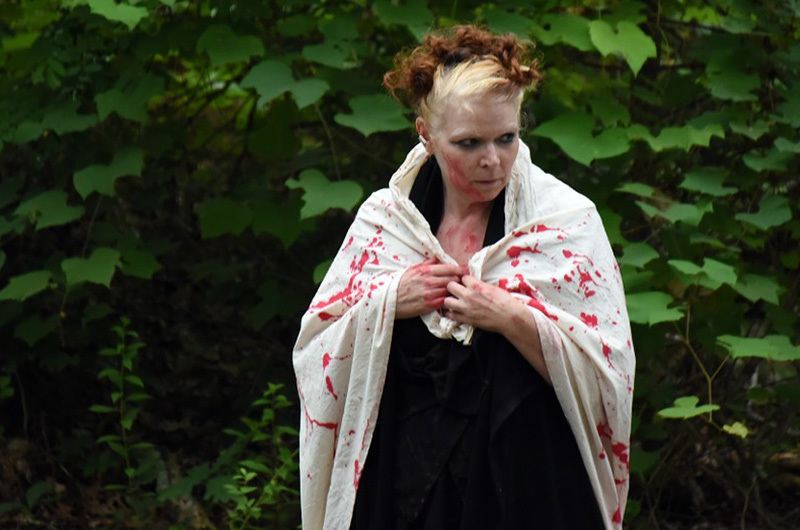 When her lifeless body was dragged up a path, an eerie trail in the dirt remained for the rest of the show. Anna Yukevich plays Marc Antony, joining the production only a week before the show went up. Her rage after Caesar’s death is powerful and unbridled. Alley Ellis, who plays Casca and other supporting roles, spoke the iambic pentameter as naturally as a casual chat. Four-year-old Isla enjoyed the entire show, sometimes whispering about who might get killed next, showing that the stories ring true now for all ages as clearly as they ever have. 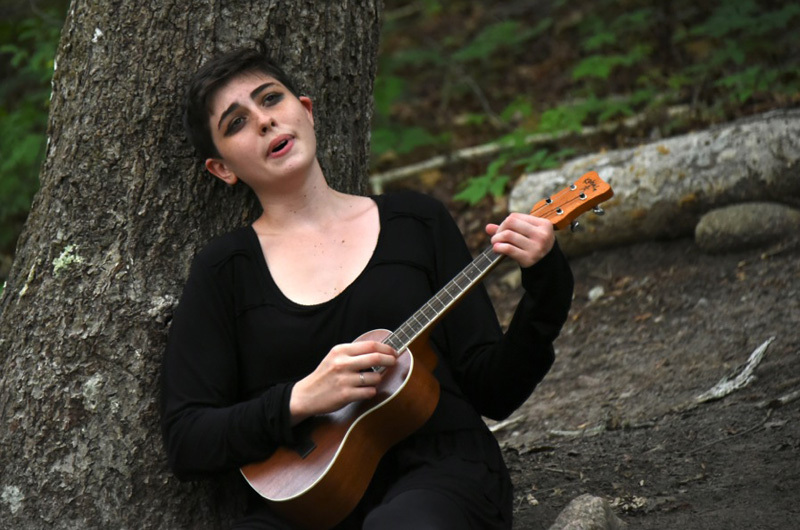 Julius Caesar is performed at the Tisbury Amphitheatre by the Tashmoo Overlook at 5 p.m. on Wednesdays through Saturdays through August 12. Tickets are available at the door, cash only: adults/$20, Juniors(under 30)/$10. Visit mvplayhouse.org for more information. This show was spectacular- the acting, to a person, was flawless and the sentiment, emotion and humor were present throughout, which is a significant feat given the fact that most of us, sadly, are not accustomed to the language of Shakespeare. This performance proved to me that Shakespeare was meant to be experienced first in performance, rather than through reading. See this while you still can !